Our theme will revolve around “Art versus Commerce” as Seattle’s music scene reaches kind of a maturity in 1989. Some people, notably Soundgarden, Mother Love Bone, and Mudhoney, began getting recognition, while others did not. We will talk about what can happen to the creative process when serious money becomes a real possibility. 1:40 to 1:45…Intro/Outro by me. 1:55 to 2:10…Shanae and Kristy lead the discussion on Chapter 7 from my book. 2:10 to 2:30…Abbie talks about the London punk scene of the ’70s; Jenna presents on London metal in the ’80s. 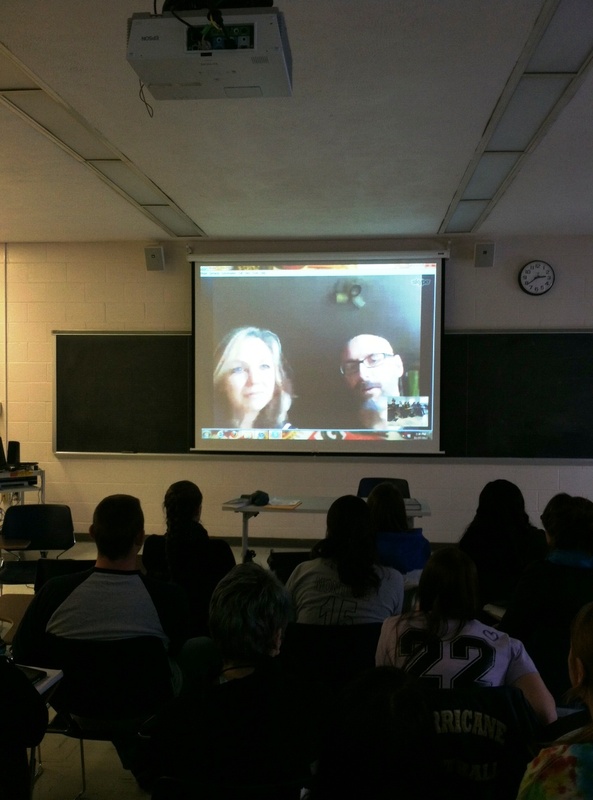 2:30 to 2:55…Q&A via Skype with the Walkabouts’ Carla Torgerson and Michael Wells led by Gabrielle. I’d have to say I enjoyed yesterday’s class immensely, up to and including our Q&A with Sub Pop Records founder Bruce Pavitt. Nearly everyone contributed to the discussions, and we even had two guests stop by for the Q&A. Reactions? Well, I think Mudhoney, TAD, and Skin Yard kind of scared them. We talked about the “sell” Sub Pop created with TAD…about these scary backwoodsmen who want to invade your homes and murder your children. I think they got the whole twisted Seattle hyperbole, especially understanding the warmth and intelligence of people like TAD’s Kurt Danielson. Students talked most about the Endino track, which appears on his first solo offering, Angle of Attack. “Sideways Savannah” is an instrumental, and began in Endino’s basement when he and drummer extraordinare Greg Gilmore began pounding on carefully laid out two-by-fours. Once they finished the percussion track, Endino added drums, bass, and guitar. The result, as one student put it, sounds “African.” I would go with Asia, given Greg’s visits to Indonesia, but regardless, I think the class got the diversity and experimentation then going on in the Seattle music community. Finally, the main event, a chat with Bruce Pavitt, founder of Sub Pop records, and tastemaker within the Seattle music community. I had not interviewed Bruce for my book, although I had attempted to make contact. I asked him for an interview upon spotting him at the 2008 Sub Pop 20 Fest. Unfortunately, he thought I wanted to bother him with an interview there. (With the volume of the music, he couldn’t hear that I wanted to do a phoner at a later time.) Afterward, I saw him sort of eyeing me during Green River’s set…I think he thought I was a stalker (I’m not one…really…I just looked weird wearing my Geezerfest shirt.) Later, I sent him a copy of my book. 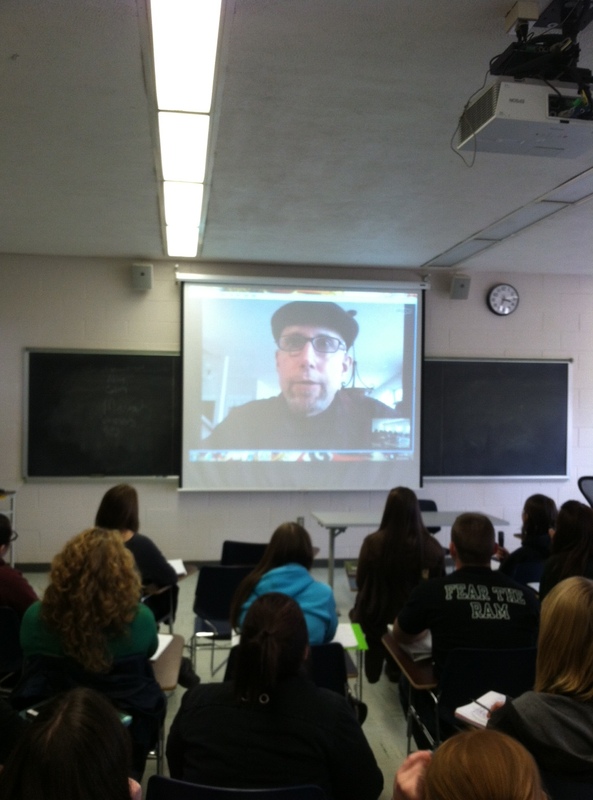 He said nice things about it, and graciously agreed to chat with my class. One student mentioned yesterday’s release of the new Soundgarden record, King Animal, and asked what Bruce thought of it. He mentioned he had only heard one track, but nonetheless liked it. Bruce talked about growing up with Soundgarden’s guitar player Kim Thayil in suburban Chicago…and about how Kim basically lived at his house, even dating two of his sisters. Another student asked Bruce about the origin of the word “grunge.” I kind of braced myself, because in my book I mention Bruce first using the word in an ad for a Green River record, in the April 1988 issue of the Rocket. Afterward, the Seattle media picked up the term to describe everyone from Mudhoney to Swallow to Nirvana. My fear was that Bruce might provide a different version of events, and fortunately for me and my tenuous credibility, he backed my story. As far as where he came up with the word itself, Bruce couldn’t recall specifics. No one can. Regardless, he felt the term did squarely apply to bands like TAD and Mudhoney, in terms of their raw musical styles and raggety fashion sense. A student then asked him why certain bands “make it” and others don’t. Bruce kind of put it like this…he said, when it comes to the music industry, justice does not exist. Some immensely talented bands get nowhere, while other mediocre acts become enormously famous. In addition to the music itself, a lot of it depends on timing, luck, and the quality of the recordings. Topic: Grunge and beyond: Seattle in the late ’80s. Special Guest: Sub Pop Records founder Bruce Pavitt via Skype. Text: Tow, chapters 5 and 6. 2:05 to 2:25…Julia and Samantha K lead the discussion on the music and reading. 2:30 to 2:55…Q&A via Skype with Bruce Pavitt, led by Morgan. Bruce began his music life with a small fanzine called Sub/Pop at Evergreen State College in Olympia, Washington. There, he pursued his passion for uncovering music scenes not named London and New York. After putting out three cassette compilations at Evergreen, he moved to Seattle where he began to write a column for the Rocket, Seattle’s monthly music paper. In 1984, he formed a record label called Bombshelter and put out an EP by the U-Men (the world’s greatest band.) 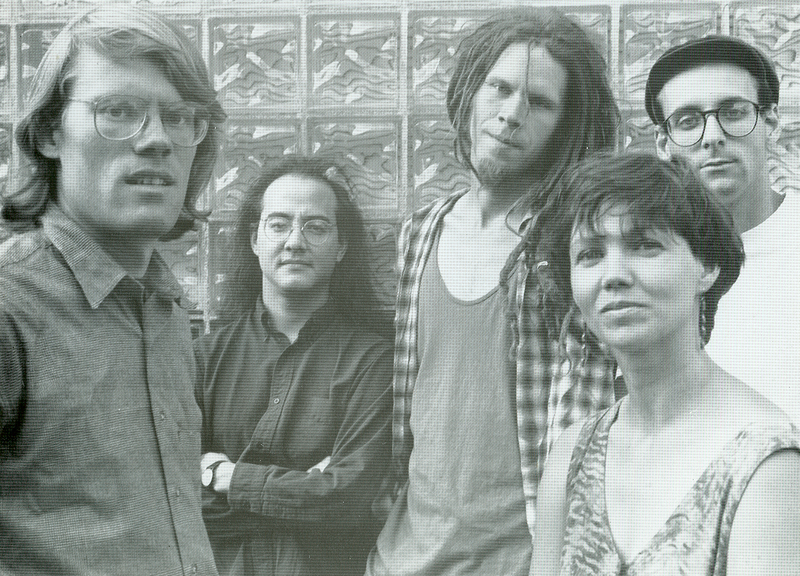 Later, he founded Sub Pop Records, turning it into a full-time entity in 1988 with partner Jonathan Poneman. Up to that point, the label had put out two EPs by fledgling bands Green River and Soundgarden. 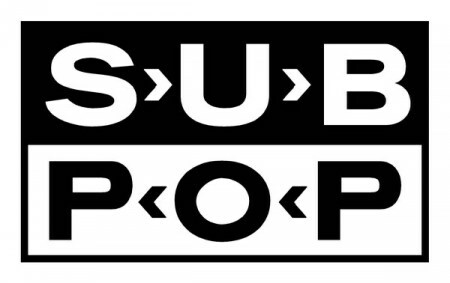 By 1989, Sub Pop had become Seattle’s premier independent label, featuring grunge acts like Mudhoney, TAD, and Nirvana.